Carousel is probably best known for its revered scores, but since its inception into the history of musical theater, the world has drastically changed causing the story to strike a different chord. The Rodgers and Hammerstein smash is a classic musical marred by a controversial plot line in our current landscape, and yet it has been revised on the Great White Way today. The daring revival is a fine production with no bells and whistles that still manages to dazzle despite some choice decisions. 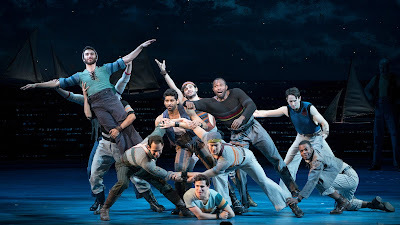 Helmed by Jack O’Brien with choreography by Justin Peck, Carousel is the story of a late 19th century Maine town and the budding romance of Julie Jordon, a young millworker, and Billy Bigelow, a carnival barker. As love turns to marriage turns to family, conflict and tragedy arise causing Billy to act out in an uncouth manner. What may not have been considered too taboo at the time of story and production, the relationship between Julie and Billy is an abusive one. While there were certainly cuts made in this revival, it’s impossible to eliminate this plot point so the moral of this revival is how director Jack O’Brien handled the situation. You hear the physical abuse plot line differently with a modern ear, and yet the impact is not necessarily reflected in this production. Lindsey Mendez steers the ship in her response to Julie’s declaration that Billy has hit her, yet while we desire a different reaction, one of more anger and repulsion, Mendez’s Carrie stays true to the time and reacts in a blasé manner. So why is this singular beat in a musical that hits nearly three hours important? The overall picture of this particular revival. Billy Bigelow, even when given his second chance in life, cannot change his angry self. When the Starkeeper sends Billy back to earth and has an interaction with his daughter Louise, he too, strikes her and instantly regrets it. Thusly, Billy’s redemption arc is unchanged. With how this revival is cast, does it also make Carousel the story of an “angry black man.” It’s very possible. Joshua Henry is poised and delivers an exceptional performance as Billy. He has all the tools and depths to capture the seduction of the barker. But with the show still being a period piece, attention to this narrative is inherently called despite Henry’s boisterous tone and impeccable voice. Jack O’Brien infuses a charm into the world. Even with darker themes, their production of Carousel has a light aura and a splash of whimsey allowing the truth to be glossed over. And that seems truth with some of the cuts made to the text. When it comes to the vision of the piece, O’Brien put the focus on the movement rather than the aesthetic. In a totem pole of priority, you have to imagine that choreography was on top. Justin Peck was given a stunning canvas of bodies in which to work with, and thusly expand the tuner “Blow High, Blow Low.” His balletic choreography tugs at the heart. Some of the musical staging doesn’t quite match the gusto in which he brings in the previously mentioned number and “Ballet.” With often a blank space to play in, the imbalance of styles comes across, at times, as incomplete. If choreography was on top, you can likely say that scenic design got the shaft. There was little grandeur in Santo Loquasto’s design. Imagination in theater today goes a long way, but sometimes you just want to see a damn carousel at the carnival! Peck was given the chance to make up for the architecture Loquasto was missing. In pictures, the seascape with the boats floating in the distance provided a nice visual, but up close and personal, it came across as a cheap diorama. Further, the boardwalk sculptures seemed out of place for this style of theater. Watching the actors attempt to maneuver as they walked on them was an acting challenge in itself. The costumes from Ann Roth were stylistically accurate with a flurry of patterns and textures. And yet they had little impact on the overall visual. Whether it was O’Brien’s approach on the material or the magnitude of the actors, this revival of Carousel had a strong focus on Billy Bigelow. As mentioned, Joshua Henry gave a solid performance. Billy makes mistake after mistake, and yet Henry manages to allow Billy to get away with it. His impassioned “Soliloquy” closed Act I with great fervor. Henry’s biggest flaw in the show was during his unfortunate death scene, choreographed by fight director Steve Rankin. If ever there was a death scene that lacked stakes, this was it. Jessie Mueller’s Julie has been pushed to the backburner of focus in this revival. Mueller had an opportunity to tackle the classic score and succeeded. But her characterization of Julie was minute in comparison. She attempted to show depth as a strong woman, but it never quite made an impact. Lindsay Mendez as Carrie Pipperidge was a light in the darkness with impeccable comedic delivery. She wasn’t the soft and dainty optimist of usual Carries, as she opted for something a tad more jovial. Nettie is a saving grace for Julie in this story. And in a way, Renee Fleming was a saving grace for this production. Her voice soared in this score. Whether it was the forever infamous “June is Bustin’ Out All Over” or the anthem known as “You’ll Never Walk Alone,” Fleming provided enough emotion for all. Consistency is key for a successful musical. For the most part, O’Brien instructed his cast to adopt the New England dialect. It’s a unique one, for if someone doesn’t have it, it surely stands out. Perhaps being a dancer first, actor second is to blame, but Amar Ramasar’s Jigger failed in his portrayal. Some can excuse a botched dialect when the dancing is so strong. When he wasn’t showcasing his talents through dance, Ramasar was simply out of place. After this revival of Carousel, can the story have a redemption arc for a modern audience or has the #MeToo movement influenced our culture to the point where Carousel has become obsolete? This Carousel is fine, it has a cherished history to fall back on. Dare I say, it just needed a little more time and a firmer vision to be what Jack O’Brien and his team desired it to be.